The Connacht Shield Team overcame Swinford Golf Club yesterday evening by winning the Three singles matches at Home to progress to the Zone Final against Achill who beat our near neighbours Mulranny ,who had Home advantage in that match. Team Captain Damien Murphy, Cormac O Muirithe and Martin Cosgrove all won their matches here while the two foursomes matches away were lost. So it's Achill with Home advantage who stand in our way of a Provincial semi final place with the added bonus to the winners of a Home draw in that match. 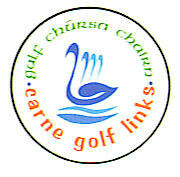 The match against Achill will be played on Monday 10th September so your support for the two foursomes pairings in Carne that evening would be greatly appreciated. The Connacht Shield Team started their campaign yesterday August 7th with a great victory against Castlebar. Team Captain Damien Murphy led the way with a victory in his Home Singles match and this was followed by another victory at Home by Cormac O Muirithe. Nathan Ruddy was all square after 16 when he was 'called in' as the duo top right, David Gaughan and Seán Lavelle claimed a great Foursomes victory in Castlebar. Noel McLoughlin and John Ginnelly completed the team of ten. The next round is on Monday August 20th against Swinford Golf Club who defeated Ballinrobe. Again we will have the three singles matches at Home with two Foursomes away. 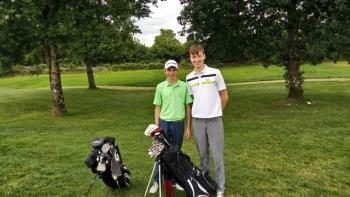 Swinford had a very similar result to ourselves with two Home Singles wins and an Away Foursomes victory in Ballinrobe. The Captain at Swinford Golf Club this year is Erris native Philip Irwin.